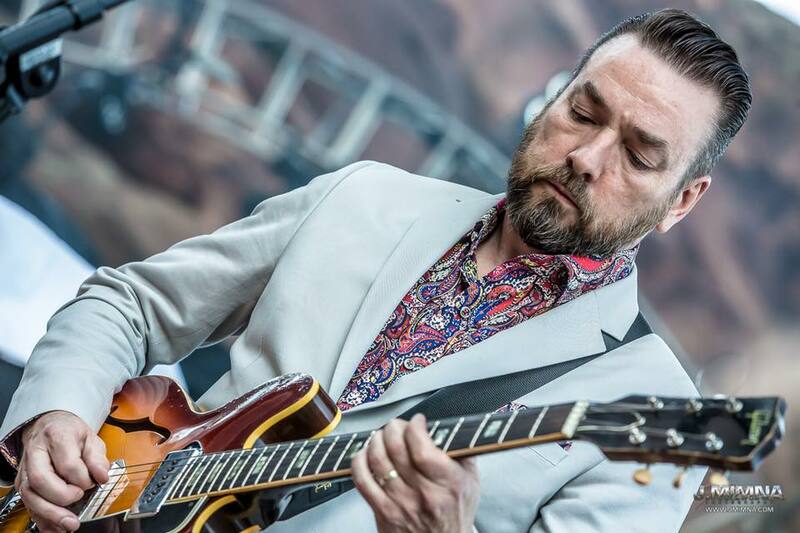 New Mastersounds’ guitarist Eddie Roberts clearly knows a few things: he knows how to play that guitar, of course, but he’s also very knowledgeable about great soul, funk and groove-oriented music so he knows a good thing when he hears it. Combine these talents, skills and wisdom with his obvious love of the arts community and extensive experience in the music business, and you get Color Red, his new record label. With a growing roster already featuring some of the best artists currently playing soul, funk, R&B, and hip-hop, it was no problem for the new agency to bring one of the most exciting and talent-packed shows I’ve ever attended to Cervantes’ Masterpiece Ballroom and Cervantes’ Other Side last Friday. Eddie Roberts. Photo Credit: J Mimna. It’s one thing to talk about supporting the scene and each other, but action is proof, and the abundance of activity at this event gave overwhelming evidence that Color Red’s focus is on nurturing our community and the musicians who populate it, while bringing along some of Denver’s best visual artists as well. More than just a “show,” it had the feel of a ‘60s “happening;” a gathering of those who love to come together to celebrate life, music, art and each other to elevate the scene and the individuals who give it vitality. Primarily a concert featuring the star-studded Matador Soul Sounds, local funk/soul masters Analog Son (who were celebrating the release of their monstrously wonderful new album Funky Mother), and the explosive, joyful music of Congo Sanchez, with DJ sets from heavyweights Quantic, Nobide and Recess, plus a patio set by the local groove collective known as Free Bear, there was also a sizable contingent of mind-blowing Denver visual artists courtesy of Matt Worldly and his Denartket group. If happy smiles, ecstatic dancing, blissful revelry and massive hugs are your units of measuring the success of an evening out, you’d have had to bring a huge tape measure to wrap around this night. There were some “bigger names” involved, of course, but another thing that struck a pleasing chord for me was that none of these musical and visual artists were ultimately given any more star treatment than any of the others. This was a dual-venue event which flowed freely back and forth between Cervantes’ larger Masterpiece Ballroom and their Other Side next door, and from the beginning DJ sets and Free Bear on the patio to the closing All-Star Jam, every performer got plenty of attention and room to spread their talent and love. Analog Son. Photo Credit: Jarred Media. I’ve been an Analog Son fan for years, and I’ve never been less than thrilled by their shows, but Friday’s set topped them all. From the minute they took the Ballroom stage, the crowd were willingly and joyfully entranced, as the band smoothly and solidly drove through a set that started strong and just kept getting better. The songs from the new Funky Mother album sounded just as assured and wild as any of their older material, and their outrageously wonderful set-closing cover of The Beatles’ “We Can Work It Out” was on a level with Earth Wind and Fire’s reworking of another Beatles’ classic, “Got To Get You Into My Life”. If you still haven’t seen Analog Son live, you’ve got to get yourself to one of their shows soon. Their new album is a heavy slab of electrifying funk and soul, produced by Eddie Roberts himself, and is one of the most live-sounding studio releases I’ve heard. Since it’s the first record the band has made featuring all the members of their performing lineup, this was not surprising to me, but I’m overwhelmed by the power with which they brought that live intensity to the finished product. From founding members bassist Joshua Fairman and guitarist Jordan Linit to saxophonist Michael Chiesa, trumpeter Gabe Mervine, drummer George Horn, Will Trask on percussion and keyboardist Eric Luba, all the way to the beautiful and spine-tingling vocals of Devon Parker and Ashley Niven Fairman, everyone on this record shines like the stars they all are. There was some overlap between Analog Son’s set and the frenzy being generated on the Other Side by the musical powerhouse known as Congo Sanchez, but while I didn’t have the luxury of catching their whole set, these guys were my big happy new discovery of the night. It was deliciously overwhelming to run next door and be hit by the delirious onslaught of their sound and presence. Utilizing live drums and guitar and featuring an irresistible vocal duo of frontmen/emcees, it was easy to see why this group resists being pigeonholed into any genre. While their overall sound is something one might call “live hip-hop,” I think it’s fitting that their Facebook page just says “MUSIC” next to the genre slot. Matador Soul Sounds. Photo Credit: J Mimna. Now what can I say about Matador Soul Sounds? First of all, I should defer to the words of formidable singer Adryon de Leon when, early in their set, she protested against the use of the term “supergroup” to describe this band. “Don’t get it twisted!” she said, and then went on to explain that they consider themselves a group, period- one that has put their individual gifts together to write songs as and for Matador Soul Sounds, and for us as their beloved audience. This distinction is important because it reflects the genuine humility of all the admittedly illustrious members of the group. Yes, Eddie Roberts is part of New Mastersounds, Adryon is the singer of the great Orgone, Alan Evans has achieved renown not only as the drummer of Soulive but also as a producer and member of other projects, and Kim Dawson has gone from work with the legendary Pimps of Joytime to further build a name for herself as one of the most dynamic and hardworking singers alive. But onstage, on record, and up close and personal, they’re all just total sweethearts who never let their status or egos get in the way of the real business at hand, which is to deliver the best music and the warmest love they possibly can to us, their fans. Their performance on Friday certainly locked me for life. Every song was a treasure chest, every note was a gem, and I’ve never felt more love and joy coming off a stage and flowing over a crowd. To return to the subject of community, the glowing memory of a night like this wouldn’t be complete without returning to the many visual artists who gave their creative energy to the event, and they were everywhere. According to Denartket founder and coordinator Matt Worldly, he was thrilled when Eddie Roberts approached him at one of their recent events about bringing the collective’s artists to this show, because the whole purpose of the group is to plug these artists into the bloodstream of the Denver area. It was impossible to ignore the essential element they brought to this celebration, and the discovery factor was greatly enhanced for me by watching these delightfully creative individuals pour themselves into it, crafting their works in the moment, sharing their insights and visions with everyone. While space doesn’t allow me to give credit to every one of them by name, they all deserve your attention and will reward it with fabulous visions to feed your hearts, minds and souls. Some of those whose work especially grabbed me were Pher01, Chris Surposa, John Vega, Parker Ledford, Derek Carpenter, and the delightful Bobbi Larmer, some of whose work has now found a place in my home. These are just a few of the great talents represented by Denartket, and we’d all be enriched by following every one of them, including Worldly himself, whose work is as otherworldly as anyone's. I hope I’ve given you enough encouragement and inspiration to follow and discover every one of these groups and creative people for themselves, because one of the absolute and indisputable home truths of all art and the blessings it brings is that if I keep it to myself, I miss out on one of its greatest gifts, and that is the almost inexpressible pleasure of sharing it with you. If you’re already part of this community, I can’t wait to see and share with you again. If you’re just arriving, we welcome you with open arms and hearts, because without You, there can be no Us.